In my previous entry in this series I was looking at how the stories from the Hebrew Bible that the earliest filmmakers adapted into the first silent Bible movies. The idea of canonicity naturally leads to thinking about which books of the Bible have been covered and which haven't, but there's also something of a disconnect here because few films have sought to adapt an entire book of the Bible. There are obviously those which adapt a gospel word for word (Luke 1979, Genesis 1979, Matthew 1994, Acts 1996, Gospel of John 2003 and the various entries in the Lumo Project 2014-present) then there are others which haven't gone to this extreme but whose films have been substantive adaptations of a single book (Il vangelo secondo Matteo, some of the Bible Collection films, Moses the Lawgiver to name but a few) but not word for word. However, in general terms, complete books of the Bible have not naturally lent themselves to being film scripts. Indeed even those word for word adaptations cannot really be counted here as they are part of a specific project rather than the need to find a good plot for a film. In fact films tend to gravitate more naturally around specific character(s) than specific books. So when we think about canonicity in relation to the biblical narratives it is perhaps more helpful to think about narrative units within the Bible (which may even span the divides between specific books as some films do), rather than individual books, as is usually the basic unit which is discussed in regard to canonicity. Which leads onto the Gospels. Aside from the few films intentionally based on a single gospel, most of the films about Jesus have harmonised the available selection of stories from the four (canonical) gospels. A few films have even widened the net here to include incidents from other, non-canonical gospels, such as The Young Messiah's use of the Gospel of Thomas. Again this is because these films tend to be about the lead character of Jesus and then filmmakers tend to pick the particular stories from the gospels which best portray their vision of Jesus. And just as I think we see certain trends in which narratives from the Hebrew Bible get made into films, I think we also see a similarly uneven pattern when it comes to which parts of the Gospels get covered and which don't. Peter T. Chattaway, for example has recently highlighted numerous narratives which "most Jesus films miss"1 suggesting that whilst some parts of the Gospels are not really considered part of any theoretical filmic canon. 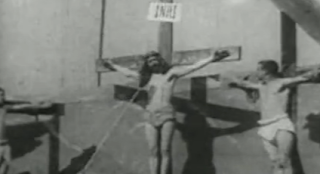 Of course many of the very earliest films were films about Jesus - most commonly about his passion - but even before the start of the 20th century, films depicting the miracles of Jesus, such as Georges Méliès' Le Christ marchant sur les flots (Christ Walking on the Water, 1899), were being released. One complicating factor in trying to discern any patterns in the release of early Jesus films is the way that many of these films were not released as complete units, but were available for exhibitors to pick and choose which parts of the story they wished to display. The situation is further complicated by the fact that many of these collections of tableaux were expanded over time, the "films" being re-released with new tableaux added in, or some of the older footage re-shot, often retaining the same mise-en-scène. All of which is a long way of saying that when it comes to looking at the idea of canonicity in relation to Bible films, it makes more sense to base such discussion on the basic unit of each "episode" or incident rather than individual books/gospels. Some of those may only appear very rarely, such as those highlighted by Peter in the link above; others appear far more commonly, such as the crucifixion. Returning, then, to the early silent era we discover this is borne out by the films we find from this era. It is difficult to be precise with figures, particularly because many of the films from this era are presumed lost, some of those that remain are related to others from the period, and it is difficult to be certain in many cases whether the version that remains is the original version. Indeed the DVD version of the latest film from this era Christus features a resurrection scene entirely lifted from a different Jesus movie (there's a little bit on that here, including the comments). Nevertheless, even treading carefully in light of the above, there are a number of observations that can be drawn. The first and rather unsurprising conclusion is that Jesus' death and birth are very much a part of this "filmic canon". 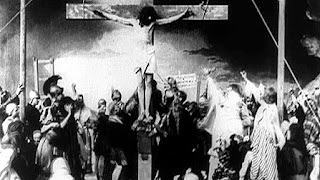 Of the thirty or so films made about Jesus in the early silent era (not counting the six films about Herodias' daughter) around 18 feature the events of Jesus' Passion. The "canonical" status of this part of the story was established early on - of the eight Jesus films made in the 19th century only Georges Méliès' Le Christ marchant sur les flots (Christ Walking on the Water, 1899) was not primarily about Jesus' death. The second is that, as a group, episodes from Jesus' ministry appear appear more frequently than the events of Jesus' passion. As mentioned above just over half of the thirty Jesus films depict Jesus' death, but twenty include at least one incident from his ministry (and that is excluding the six films about Herodias' daughter, which could also be considered to be "stories from the ministry of Jesus"). Of those twenty, only nine are films that features both Jesus' ministry and death, the majority of the rest are films made about single incidents. A look at these single incidents is instructive in and of itself. The parable of the Prodigal Son was adapted four times. The only other parable to be covered is the Good Samaritan. Then there are the miracles which include the coin in the fish's mouth, the resurrection of Lazarus and the healing of a blind man. Lastly there are more general incidents such as Jesus' encounter with the woman of Samaria. The films that featured both Jesus' ministry and his death tended to be longer and include several episodes from his Ministry, many of these would not appear much in the future films about Jesus' Life. The 31 films from the 1903 Lubin series The Passion Play featured episodes such as "Christ and the Disciples Plucking Corn" and "Christ Calling Zaccheus from the Tree". Several films featured Jesus meeting those from outside Judea such as the woman from Samaria (several films) and the healing of the Widow of Nain's son in the earliest remaining Jesus film The Life and Passion of Jesus Christ (1898). Of course we also see other incidents cropping up that would continue to feature in a large number of films such as the woman taken in adultery, the woman who anoints Jesus' feet, the Sermon on the Mount and the feeding of the 5000. One final point at this stage is that many of these films about Jesus do not include his resurrection. The most obvious example is From the Manger to the Cross as it is the only of the films covering both his life and death not to include these incidents, but also many of the "Passion" only films did not feel the need to include the resurrection. This is interesting as later films which excluded the resurrection were heavily criticised for doing so, even if, like Jesus Christ Superstar (1973) they were a variation of the passion play tradition. For a long time I've been meaning to sit down and actually watch La naissance, la vie et la mort du Christ (The Birth, Life and Death of Christ, 1906) and last night I finally did. I'm going to save my proper review until I've done a bit more background reading, not least David Shepherd's Chapter on it in "The Silents of Jesus in the Cinema (1897-1927)". The film, which was directed by Alice Guy Blaché for Gaumont is 1906, is in many ways quite a different film from Pathé's various cuts, though interestingly it also uses intertitle cards to literally give the title of the scene we are about to witness, which makes compiling a scene guide relatively easy. It's been a while since I did one of these so you might want to refresh your memories as to how I use gospel citations in scene guides. I can't quite remember where I got the version I watched last night from, but it's intertitles were in English, whereas some of the version on YouTube have French intertitles on charming cards complete with pictures of angels. I've kept these in English, which seem to be a pretty good translation. In nearly all cases the scene announced by the preceding title card consists of only one shot. There are two exceptions. The first is "Saint Veronica" where the first shot captures the moment Veronica captures Jesus' image on her cloth, and then cuts to a slightly later mid-shot of her alone holding the cloth. The second is "The Resurrection" where the scene starts inside the cave where the tomb is while we see Jesus be resurrected and the guards react in fear. Then we move outside the cave to see the arrival of the woman, and then we are taken back inside the cave where the women witness the empty tomb. Interestingly, if you were solely looking at the images in the resurrection scene, one might assume that the soldiers' fear is because they see the resurrected Jesus, but given how the angels work in this film, not least the way they appear and re-appear, it does leave open the interpretation that the soldiers cannot actually see the angels or the resurrected Jesus, they just see the empty tomb. It is only the audience who sees the full picture. One of the interesting things about this film is that even though it came to be known as simply The Life of Christ there is relatively little "life" in comparison to the "birth" and "death" scenes which are also included in the full title. Of the 25 scenes, only three ("The Samaritan", "The Miracle of Jairus' Daughter" and "Mary Magdalene Washes the Feet of Jesus") are connected with neither Jesus' birth or passion. The first of these scenes was popular in the early silent era, but for many years was ignored, at least until more recent times. What is noticeable about these three scenes is that they are three, relatively rare, episodes of the gospels where the main character, apart from Jesus, is a woman. That, combined with the way that the film includes Veronica and ends on the women finding the empty tomb without the male disciples are among the factors that have led to some to see this as a feminist picture. Finally there's a really useful page here with lots of promotional material for the film and Alison McMahan - who has written one of the books about Guy Blaché - has a piece on the film at her own website, where she gets into the relationship between Guy's film and Tissot's work. A common response when I mention silent film versions of Shakespeare is confusion. A look that says "but how would that even work? ", usually followed by a question as to how they "do the speeches". And it's not just my friends. I'm really enjoying Daniel Rosenthal's book "100 Shakespeare Films" at the moment, but of the 100 films he discusses, there are only 5 that date from cinema's first 30 years. Yet there were 300 or so films from the silent era that were based on the works of Shakespeare. I think part of the reason I notice this is that it's not a question that ever occurred to me, at least not until I started talking to others about it and, I guess, it's an understandable response. Shakespeare is after all known as England's greatest ever writer. And yet, for all the great speeches there are also a host of great images. Shakespeare is not just "To be or not to be", it's also about a man holding his former jester' skull; it's not just about "Now is the winter of our discontent" but also about the hunchbacked king"; "When shall we three meet again" only comes into fullness when paired with a vision of a dagger and, of course, that damned spot. The reason this matters is that film is primarily a visual medium. The best adaptations of Shakespeare, whether silent or otherwise, are those that capture the tone and mood of Shakespeare's words. It's the shot through the staircase from Ophelia below to Hamlet high on the top of the turret in Olivier's Hamlet (1948), or Branagh's bloody, exhausted yet joyously victorious Henry V at the end of Agincourt. But this also means that the best film adaptations of Shakespeare, are those that start not in the service of the text, but of the final image. Those where the aim is not to do dutiful service to the Bard, but to create something special for the screen. Shakespeare's plays may be a means to that end, but it just sort of happened that way. It wasn't a drive to make Bill "more accessible", but to make a good film which, on this occasion, as it turns out, happened to mean using Shakespeare. The best film I've come across in this respect yet isCharles Kent and J. Stuart Blackton's A Midsummer Night's Dream (1909, pictured) where the focus is clearly Puck who is played by a fairly young girl who flits about the screen with innocence and delight, floating I the air with her lightness of spirit. This isn't about flashness or technical wizardry - it's on a par with decent youth theatre and probably far easier to spot the wires - it's about the lightness of the image. The recent BBC adaptation of "Midsummer" was full of whizzes, wizardry, impressive effects and all the speeches but it didn't touch me anyway near as much as the 1908 version. No doubt some will dislike its portrayal of Puck as to being true to the play, but again this isn't necessarily the right question. The quality or importance of a film isn't about the source material it is adapting - that's what reading the book, or watching the play on-stage is for. What matters is the final film, the images on the screen and whether what is created is of merit on its own terms. The are some pretty torpid adaptations of Shakespeare out there where everyone is dutifully performing so that the audience can undergo the literary equivalent of eating their greens. All very respectful and faithful, but bad, bad cinema. All of which got me thinking about another literary pillar often adapted for the big screen - the Bible. like Shakespeare, people say it matters, they want. To be respectful of it and often believe that it'd be good for people to have better appreciation and understanding. The two collections inspire in many a kind of earnestness. If anything these tendencies are even greater with the Bible. And so many people start with the idea of making a film based on the Bible. They're not asking the question, of all the topics available what will enable me to make the best moving visual image I can make, they're starting with a text that they want to get across. And then they're surprised that their project has become such loathèd medicine. For some of the insights in this piece I'm indebted to Bryony Dixon and Judith Buchanan whose recent BBC programmes on silent film adaptations of Shakespeare and been interesting, informative and really enjoyable. (Dixon appeared in BBC Birmingham's "Silent Shakespeare"and Buchanan ib BBC Radio 4's "An Excellent Dumb Discourse". At the time of writing both are available to view online in some regions. At the end of last year I started a series looking at how the idea of "canon" relates to the Bible on Film. There's not been much on it recently maybe because I decided that to write on the subject with any authority I needed to do some proper research and produce the fullest list possible of filmed version of the Bible so that I could do some analysis on them. That in itself has become a project in and of itself and I'm hoping to write more about that soon. For now however the logical place from where to continue the series is at the beginining, in that earliest part of the silent period I discussed in the previous post in this series. In the period up to the end of 1915 (prior to the release of D.W. Griffith's Intolerance) at least 114 films based on the Hebrew Bible were produced. From a quick glance of these, it seems all the usual suspects are present. Moses, David, Adam and Eve, Abraham and Samson all feature fairly prominently and there are also films about Joseph, Esther, Noah, Solomon and others who have consistently proved popular for filmmakers, preachers and Sunday School teachers alike. But it's not long however before other far less usual names start to occur. 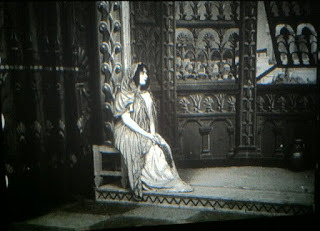 In 1910, the year when perhaps more biblical films were in cinemas than at any other point in history, Gaumont released the fourth entry in their Les Sept Péchés Capitaux series, La Luxure which told the story of Susanna and the Elders (based on the deuterocanonical story of Susanna - Susanna/Daniel 13). This tale of attempted sexual coercion and false accusation is fairly dark for the period although it's not hard to imagine its message of the importance of female virtue might be something the filmmakers wished to stress. The following year Gaumont released Fils de la Sunamite (1911, The Son of the Shunamite) directed by Louis Feuillade. This story, based on an episode from the life of Elisha, has less dramatic potential, but obviously a strong emotional element, and its appeal is based more on miraculous elements than the spectacular. Elisha's only other screen appearances are as a cartoon, from the Animated Stories from the Bible series, Elisha: Man of God (1994), Riding for a Fall, part of the Bugtime Adventures series and the subversive online animation Don't Dis Elisha from Extreme Bible Stories (which I discussed here). Just as active in this period were Pathé Frères who released Athalie (1910, dir. Michel Carré) about queen Athaliah, the daughter/sister of King Ahab who seized the Jewish throne after Jehu's revolt (2 Kings 8 & 11). It's a fascinating story that contains more than enough drama to fill the film's 20 or so minutes, but which has, to my knowledge, only been attempted two other times in the entire history of biblical films - two sixties, made for TV, productions from France (1962, dir. Roger Kahane) and Italy (1964, dir. Mario Ferrero). The following year Pathé Frères produced a slightly more familiar Old Testament film - Jaël et Sisera (1911), one of the many biblical films directed by Henri Andréani in this period. This is, as far as I can tell, the only time the events of Judges 4 have found their way onto the screen and it's curious that even in this case, the story's usual leading lady - Deborah - is omitted. In some ways it's surprising to find these stories covered at all - across all of film history there are only seven versions of these four stories. After this early silent period when we get these four treatments they were almost never covered again and that the stories are relatively obscure to modern believers and audiences. 1. How many times was the film adapted in this first era of cinema? 2. How many times was it covered subsequently? 3. How well known is it to modern believers/audiences? These film versions of Athaliah, Elisha, Susanna and Jael/Deborah are notable because whilst they were covered in this early period, even then they might be considered one-offs. Furthermore, they score poorly on the last two measures. Other stories covered in this period however score more prominently in one of the other categories, but still lack a lot of coverage in the modern period. One such story is the story of Jephthah. The tragic story of Jephthah's daughter was covered no less than four times in this earliest period (Vitagraph, Gaumont, Pathé and Warner), but has only had one subsequent adaption - Einat Kapach's Bat Yiftach [Jephtah's Daughter] (1996). It is similarly obscure to modern audiences, but this subsequent swerve to obscurity is made more surprising by its popularity within this period. Perhaps this is down the first film performing particularly well at the box office, but there is relatively little evidence to support such an assertion. Another story to buck these trends is that of Judith. Arguably the most famous Hebrew Bible film in this era is D.W. Griffith's Judith of Bethulia (1914), not least because its director was subsequently catapulted into controversy and stardom. However, by the time Griffith's version had arrived there had already been three other films produced about the story (from Italy, 1906; France, 1909, pictured above; and the UK, 1912). But whereas interest in films about Jephthah and his daughter had begun to peter out, Judith films continued to appear, albeit far more rarely than most other stories, and largely in Catholic countries, hence there was one other film in the silent era (dir.Negroni, 1928), at least seven television films from 1959-1969 as well as a few later entries in 1979, 1980 and 2007. More details about these films can be found here. Whilst this story remains fairly obscure to modern audiences, particularly to those in Protestant churches/countries, there is one story that is well-known to modern audiences and was popular in the silent era and yet has hardly been adapted in subsequent periods: the stories around Daniel. The first films about Daniel were the amongst the very first biblical films, the earliest being two from Pathé in 1905, Le Festin de Balthazar and Daniel dans la fosse aux lions. These were followed up by no less than seven other Daniel films in this earliest period (five of which were from Gaumont). All the more surprising then that following the last of these in 1913, it was not until 1953's Slaves of Babylon before the story was covered again and then another gap of 25 years before the story was covered again in the Greatest Heroes of the Bible series. So it's perhaps surprising that the story has see something of a revival in recent years, mainly due to animated, church-targeted, productions or adaptations of Verdi's opera "Nabucco". What is also noticeable about films based on Daniel is the lack of a major production of the Daniel story. Slaves of Babylon is perhaps the highest profile, but even then, the Daniel story is somewhat in the background. Whilst this part of the biblical canon has been covered in film on a number of occasions, none of these have really entered into a (theoretical?) canon of Bible Films. In the next parts of this series I'll look at New Testament portrayals in this period and at some of the reasons that might lie behind the findings above.